Also sprach Zarathustra, Op. 30 (Thus Spoke Zarathustra or Thus Spake Zarathustra) is a tone poem by Richard Strauss, composed in 1896 and inspired by Friedrich Nietzsche's philosophical novel of the same name. 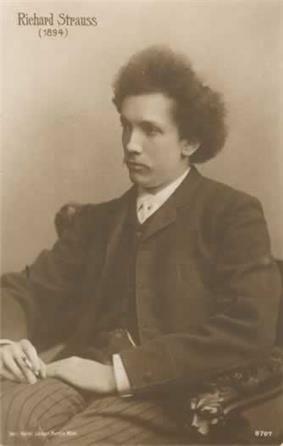 The composer conducted its first performance on 27 November 1896 in Frankfurt. A typical performance lasts half an hour. The work has been part of the classical repertoire since its first performance in 1896. The initial fanfare – titled "Sunrise" in the composer's program notes – became particularly well-known after its use in Stanley Kubrick's 1968 film 2001: A Space Odyssey. The orchestra consists of the following: strings: 2 harps, violins I, II (16 each), violas (12), cellos (12), double basses (8) (with low C string). The piece starts with a sustained double low C on the double basses, motif (from "Zarathustra's Prologue", the text of which is included in the printed score) that is common throughout the work: the motif includes three notes, in intervals of a fifth and octave, as C–G–C (known also as the Nature-motif). On its first appearance, the motif is a part of the first five notes of the natural overtone series: octave, octave and fifth, two octaves, two octaves and major third (played as part of a C major chord with the third doubled). The major third is immediately changed to a minor third, which is the first note played in the work (E flat) that is not part of the overtone series. "Of Those in Backwaters" (or "Of the Forest Dwellers") begins with cellos, double-basses and organ pedal before changing into a lyrical passage for the entire section. The next two sections, "Of the Great Yearning" and "Of Joys and Passions", both introduce motifs that are more chromatic in nature. "Of Science" features an unusual fugue beginning in the double-basses and cellos, which consists of all twelve notes of the chromatic scale. It is one of the very few sections in the orchestral literature where the basses must play a contra-b (lowest b on a piano). "The Convalescent" acts as a reprise of the original motif, and ends with the entire orchestra climaxing on a massive chord. "The Dance Song" features a very prominent violin solo throughout the section. The end of the "Song of the Night Wanderer" leaves the piece half resolved, with high flutes, piccolos and violins playing a B major chord, while the lower strings pluck a C.
One of the major compositional themes of the piece is the contrast between the keys of B major, representing humanity, and C major, representing the universe. Because B and C are adjacent notes, these keys are tonally dissimilar: B major uses five sharps, while C major has none. But the riddle is not solved. The tone-poem ends enigmatically in two keys, the Nature-motif plucked softly, by the basses in its original key of C—and above the woodwinds, in the key of B major. The unsolvable end of the universe: for Strauss was not pacified by Nietzsche's solution. Neither C major nor B major is established as the tonic at the end of the composition. In 1944, Strauss conducted the Vienna Philharmonic in an experimental high fidelity recording of the piece, made on a German Magnetophon tape recorder. This was later released on LP by Vanguard Records and on CD by various labels. Strauss's friend and colleague, Fritz Reiner, made the first stereophonic recording of the music with the Chicago Symphony Orchestra in March 1954 for RCA Victor. In 2012, this album was added to the Library of Congress's National Recording Registry list of "culturally, historically, or aesthetically important" American sound recordings. The recording of the opening fanfare used for the film 2001: A Space Odyssey was performed by Vienna Philharmonic and conducted by Herbert von Karajan. Elvis Presley used the opening fanfare as the opening piece in his concerts between 1971 and his death in 1977, and as the introduction to several of his live albums, including Elvis: As Recorded At Madison Square Garden (1972), Aloha from Hawaii Via Satellite (1973), and Elvis in Concert (1977). Eumir Deodato's funk-influenced arrangement of the opening fanfare Sunrise theme reached #2 on the Billboard Hot 100 U.S. popular music sales charts in 1973, and #7 on the UK Singles Chart. His version was titled "Also Sprach Zarathustra (2001)", and won the 1974 Grammy Award for Best Pop Instrumental Performance. ^ Listed in the closing credits of 2001: A Space Odyssey as "Thus spoke Zarathustra" but on the official soundtrack albums as "Thus spake Zarathustra". The book by Nietzsche has been translated both ways and the title of Strauss's music is usually rendered in the original German whenever not discussed in the context of 2001. Although Britannica Online's entry lists the piece as "Thus spoke Zarathustra", music encyclopedias usually use "spake". ^ Also Sprach Zarathustra! Baltimore Symphony Orchestra, January 2012. ^ "The National Recording Registry 2011". National Recording Preservation Board of the Library of Congress. ^ Soundtrack Credits"2001: A Space Odyssey". ^ Desouteiro, Arnaldo. 40 Years of Eumir Deodato's iconic "Prelude". Jazz Station. 30 September 2013. ^ "1973 Grammy Award Winners". Grammy.com. Retrieved 1 May 2011.